The Latest and Greatest in Sales Force Effectiveness | Kurlan & Associates, Inc. Spoiler Warning: This article is about my company and its new product. Stick around though and I think you’ll realize that it’s just as much about your company as it is mine. One of the proudest moments of my professional career occurred Sunday, April 21, 2013, when my team at Objective Management Group (OMG) introduced our brand new Sales Force Evaluation product to 120 OMG Partners from around the world. That we were in Boston, just one day after the second bombing suspect was captured, made it even more incredible! Partners getting their first look and using their phones to vote their approval. We have introduced our share of evaluation and assessment tools during the past 23 years, but this introduction was completely different. My team worked tirelessly for nearly an entire year on our latest gem and our Partners received it, with even more enthusiasm than we felt, when we completed the project just 48 hours earlier. Forget for just a minute how incredibly impressive the product looks. It’s the information that sets it apart from, well, even our previous sales force evaluation product, which was already the best on the planet. Of the many differences between our new and old products, the one I like the most is this one: While our old product was findings-centric; the new product isanswer-centric. Why should you care about any of this? 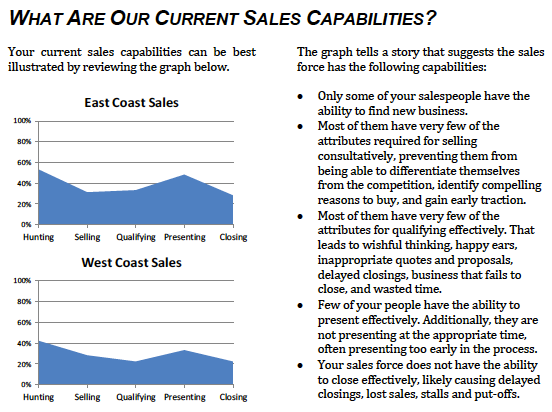 Can our sales force be more effective? If you don’t care about the answers to those 4 questions, then you must have already cashed out or retired. Can We Generate More New Business? Can We Be Better at Reaching Actual Decision Makers? Can We Shorten Our Sales Cycle? Can We Sell More Consultatively? Can We Be More Consistent with Our Sales Process? Each thoughtful explanation is supported by plentiful data points. It’s all about the science and if our science can explain the sales performance taking place at your company and how you can improve it, you would have to be an overconfident know-it-all not to be excited about this turn of events. Speaking of science, if you weren’t already following me and OMG, our highly accurate and predictive sales specific tools are legendary. Our “old” tool won the Gold Medal for Top Sales Assessment Tool in 2011 and 2012. Our sales-specific evaluations and assessments have been used to evaluate and assess more than 650,000 salespeople and sales leaders in more than 10,000 companies. If you would like to get in line and explore whether it makes sense to have your sales force evaluated in the 2nd quarter, click here and I’ll have the appropriate partner follow-up with you. Thanks for reading today – I appreciate it.